As most of you know, I do most of my summer reading sitting in the shady end of my swimming pool. I'm cool and comfortable. I'm outside and can observe any wildlife that passes through-- and I'm enjoying some wonderful storytelling. However, there are a few things that can have an adverse effect on my reading experience. Neighborhood children who bang away on their drum sets or turn on the karaoke machine and begin to yodel and screech. Daylong parties with lots of loud music. A nearby dog who gets a prolonged case of yap-itis. Normally I can do a pretty good job of tuning that stuff out. I won't throw a fit about what the neighbors do just because they're not as quiet as I am. In fact, this summer has been very quiet, and I'm not sure why. I am enjoying it, though! No, the things that can really get my knickers in a twist are from the natural world. Namely, BUGS. Since we've gone back to a salt cell to generate chlorine, I'm not constantly on the lookout for wasps and bees that have taken a swan dive into the pool and paddle frantically until they see me. They clamber aboard the SS Cathy and then have a tendency to sting me. Not a good way to treat your savior! That's why I have to be on the lookout with my flyswatter so I can bail them out before they get a chance to climb aboard. The two worst drive-Cathy-nuts bugs are flies and ants (and sometimes mosquitoes). 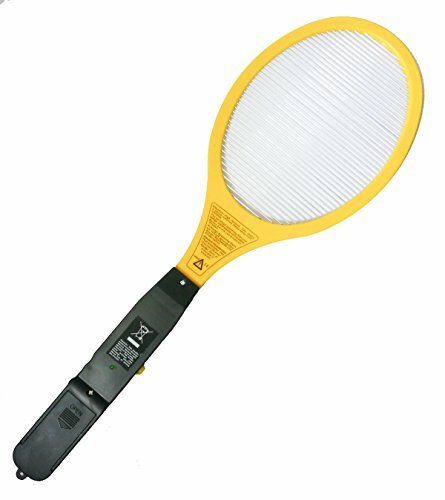 In fact, I wore out the small red flyswatter I had and needed a replacement. I can still use it to bail critters out of the pool, but now I have an electric swatter. (Cue evil laugh.) Yesterday was my first day out in the pool with it, and I have to admit that I was getting altogether too much pleasure from zapping flies and hearing the satisfyingly loud POP! As penance, I'm going to put my zapper down and head on out to the corral. These links sure are getting restless.... Head 'em up! Mooooooooooove 'em out! Heavy metals, insects, and other weird things found in lipstick through time. The wool brigades of World War I-- when knitting was a patriotic duty. In Game of Thrones news, Hot Pie opened a bakery called You Know Nothing Jon Dough. PBS will be unveiling America's favorite books in a new TV series. Secrets of the book designer: collaboration is key. The surprising function of the first coloring books. Discover the Jacobean traveling library: the 17th-century precursor to the Kindle. Medieval London: A plague grave weighed down with stones and sand shows a fear of body snatchers. Archaeologists have uncovered a "little Pompeii" in southeast France. This ancient Egyptian pharaoh is the world's oldest known case of gigantism. Archaeologists armed with lasers have discovered a secret room within the Great Pyramid. This gold coin built the Smithsonian. Watch some extremely rare footage of wild tigers in Bhutan. The crew aboard one of Sri Lanka's ships was confused by a large mass in the water. The minute they recognize it, they all jump overboard. Winners of National Geographic's Travel Photographer of the Year contest, 2017. Seven things book lovers can teach you about life. Seven reasons slow reading is actually a good thing because being a speed reader is overrated. Thirty-eight word usage mistakes even smart people make. Nineteen facts about Shakespearean England that will blow your mind. Ten female killers in fiction. The world's highest paid authors in 2017. I hope you went prepared! I came out as quotation marks, and knew most of the proper usages, but some of them I was guilty of getting wrong. No bugs. Ugh. I'm in a big city and still get mosquito bites. They do get in this apartment, although I keep windows whut and the a/c on in the summer. I still remember at the age of 5, while we were in North Carolina, getting bitten by a bee behind my knee while I rode a tricycle. Wow, did that hurt. Luckily, not been stung like that since then. Interesting quiz. I'm a semicolon, but on some categories, nothing applied to me, so I just put down something to answer. I'll try it again. I have to listen to Lehane, McDermid and Child when I have time. I love Val McDermid but feel like I need subtitles to understand her wonderful brogue. I really enjoyed listening to/watching McDermid, Child and Lehane.